A Utah man reportedly spent 30 years building a series of underground bunkers that he hoped would outlive the apocalypse, but half of them couldn’t even survive a wildfire. The system comprised four dugouts and cabins built of concrete and corrugated metal, and a few other spots where he stashed his provisions and arsenal of guns and ammunition in trash cans and barrels. All the shelters were illegally built across a 2-mile radius on state and federal property outside of Brian Head, Utah, according to a report from the Associated Press. Two of the shelters burned down in a wildfire last June. “His only intent was to defend what he had there if the end of the world was to come,” Lt. Del Schlosser of the Iron County Sheriff’s Office told AP. Schlosser added that the octogenarian man was preparing for an end-times scenario that could have involved governmental or societal collapse. Authorities have not released the man’s identity, due to an ongoing investigation, but revealed that he lives in the nearby town of Parowan. 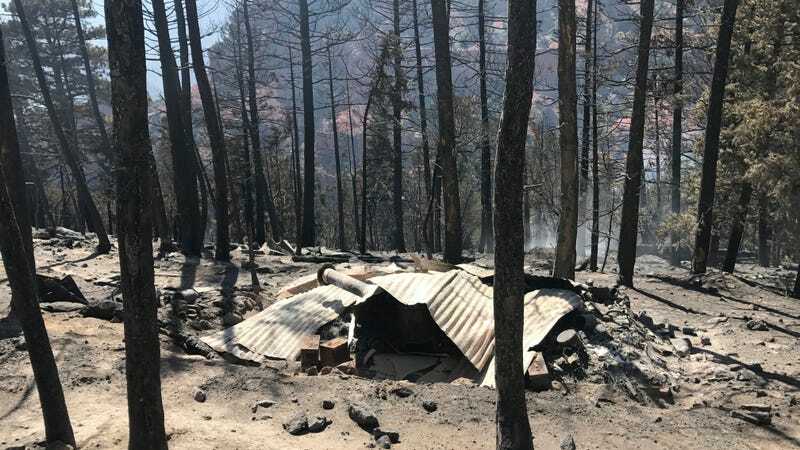 During a June wildfire that ravaged the area—causing $40 million in damage and destroying 13 on-the-grid homes—firefighters discovered one of the bunkers and cabins after hearing about five minutes of “popping” sounds, according to a release from the Iron County Sheriff’s Office. When firefighters found one of the shelters, they discovered the sounds had been caused by explosive powder. They also found dozens of inactive novelty grenades that had been modified. The man who built the bunkers apparently planned to turn the grenades into useable weapons filled with explosive powder. Days after firefighters discovered the bunkers, FBI bomb technicians investigated and disposed of the weapons and ammunition. Investigators found clues in the shelters that helped them identify the builder. Once authorities contacted the man, he helped them find the rest of his secret spots.